R&L Trigger: episode 2 - Not on "Cloud" 9? What is Lokita Playing These Days?
. :: Peace is a Lie, There is only Passion::. Did you have a group of friends that meant the world to you back when you were younger? Sometimes these friends seem to stick around forever, and other times life will call them to different places. It's ok when that happens though. Personally speaking, I've been there with my group of friends from high school and now my friends from college, but good friendships last forever. That is the point that "Kids on the Slope" does so well at getting across. The story of this series speaks the lesson that friendship is a powerful thing. This series is a bit short, but it is full of beautiful music and an amazing story about a kid that moves to a new town and goes to a new school just to find himself living some of the best days of his life. The series focuses one three friends; Kaoru, Sentaro, and Ritsuko. Kaoru moves to a new town where a few of his family members live while his father goes off for whatever reason....business I believe. The main theme of this anime is friendship, and this is shown strongly through the relationships shared between the three main characters. Sen and Ritsuko grew up together and actually live next to each other. Kaoru is a newcomer to having meaningful friendships and in many cases nearly sabotaged his new friendship with these two. All in all things always seem to work out no matter what, though the drama involved is quite entertaining. Not to mention the weird love triangles that form throughout the series. I can't even begin to really get into the details on those. The music for Kids on the Slope is simply amazing. With a heavy real world influence, viewers are treated to jazz classics like Moanin, Someday My Prince Will Come, Lullaby of Birdland, and many more. For me, the music is what gave Kids On The Slope much of its life and appeal. 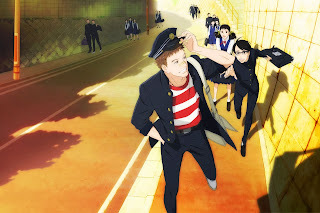 If you are a fan of good music, you will not be disappointed with the music in Kids on the Slope. All in all, Kids on the Slope is an amazing series and highly recommended. Be sure to check it out on Hulu or Crunchyroll.